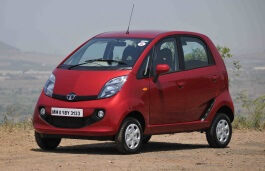 Correct Wheel Sizes, PCD, Offset, Rims and Tire specs for Tata GenX Nano series. I have tata nano genex xt I want to upgrade tyre from 12 inch steel wheels to 13 inch alloy wheel of Renaultkwid because both have same 3 hole . I think 12 inch steel wheel and 13 inch alloy have same weight and nano can take run same speed on minimum rpm it will give more mileage this is my thinking plz suggest me it is good or bed if bed what is impact will happen after upgrading tyre size.